Jambalaya is a Louisiana Creole dish of Spanish and French influence. Jambalaya is traditionally made in three parts, with meats and vegetables, and is completed by adding stock and rice. It is also a close cousin to the saffron colored paella found in Spanish culture. Left: Creole Jambalaya with Shrimp, Ham, and Andouille Sausage. 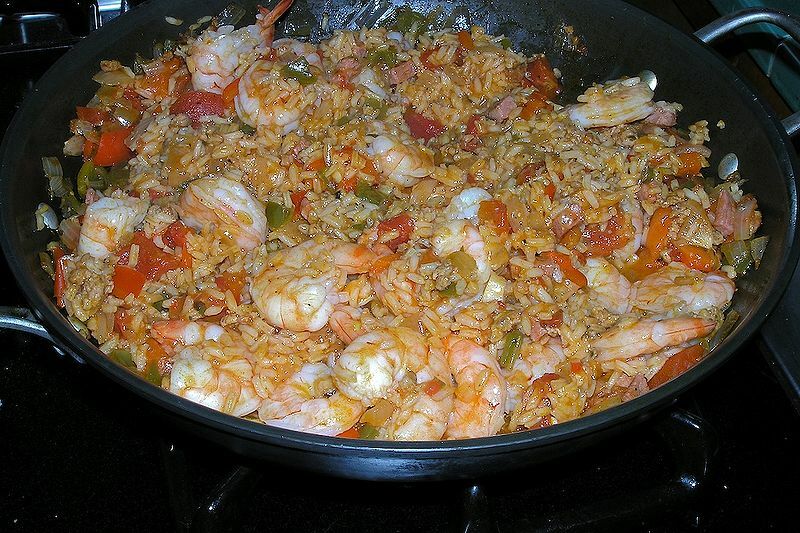 Jambalaya was an attempt by the Spanish to make paella in the New World, where saffron was not readily available due to import costs. Tomatoes became the substitute for saffron. As time went on, French influence became strong in New Orleans, and spices from the Caribbean changed this New World paella into a unique dish. The Oxford English Dictionary indicates that "jambalaya" comes from the Provençal word "jambalaia," meaning a mish mash or mixup, and also meaning a pilau (pilaf) of rice. There are two primary methods of making jambalaya. The first and most common is Creole jambalaya (also called "red jambalaya"). First, meat is added, usually chicken and sausage such as andouille or smoked sausage. Next vegetables and tomatoes are added to cook, followed by seafood. Rice and stock are added in equal proportions at the very end. The mixture is brought to a boil and left to simmer for 20 to 60 minutes, depending on the recipe, with infrequent stirring. Towards the end of the cooking process, stirring usually ceases. Jambalaya is considered by most Louisianians to be a simple dish to prepare, yet filling, rice dish. Most often a long grain white rice is used in making jambalaya.